I need to install female concrete anchors into an existing 4 inch thick concrete floor with rebar that is about a year old. This will be installed the back of my workshed, so the environment is indoors, uncontrolled temperature, out of the weather. The purpose is to bolt a class 3 trailer hitch (see picture) whenever I need to winch a vehicle into the shed. When not in use I plan to put removable plastic plugs in to keep the holes clear of debris, plus leaving it installed means a trip hazard. I'd like something that can withstand 10,000lbs across 4 mounting points. This will be very occasional use, and the most load I ever expect to put on it is 6000lbs of rolling weight. What sort of anchors do I need to get for this? I'm totally out of my depth on this. Sorry, I can't give you any good answer, other than one issue that I see is the "final" angle, when the vehicle is getting closer to this hitch and the angle of the line is getting larger. Or doesn't it? In that situation I would worry about the lifting forces that would try to tear up your hitch from the ground. Home Depot: according to my experiences, each department of the (to me local) Home Depots have (during 9-5 business hours) a professional to answer such questions. They might not be at the department at any moment and you might have to have them paged and wait for them a while, but eventually somebody with the right knowledge will show up and give guidance. OK, I'll check with Home Despot then. On the angle, this wasn't something I thought about but, the shed is 30 feet deep and the winch will be mounted at the far end. And, the winch will only be at most 2 feet lower than the attaching point and once the front wheels are inside the shed it's a very smooth, easy pull. Shouldn't be a problem. Going at it this way to make the winch a quick and easy swap. 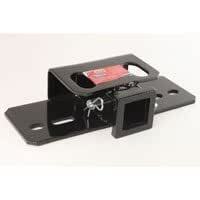 I'm also mounting the same sort of receiver hitch on my trailer, so I'll be able to move the hitch from the trailer to the shed to the back of any of my vehicles (except the Crayola) whenever I need it. So, my estimate is that your anchor setup has to be able to repeatedly withstand such force "only". Of course it is nice to have extra room for durability. With that in mind, I would design the whole thing a bit stronger. I would anchor an oversized large steel plate with a dozen or so anchor bolts. That would be flat enough and so that hopefully no one would trip over. Then I would use some type of detachable method to attach your receiver. That way you would have a piece of mind if you have to winch in a truck with a flat tire or other issues. No, I'd still need to remove the whole thing. I'm the sort that will trip repeatedly over a weave in the floor if it's more than half an inch or so. However, I'm not adverse to the idea of a larger steel plate to help strengthen the attachment point as I'd prefer to not have a winch meeting me in the middle of the garage. I can get the receiver hitch welded to the center of the plate. What size a steel plate would you suggest for this, and how many anchors? To make a suggestion on the specifics goes out of my depth as well. But shooting in the dark, I would try to source a half inch thick steel plate, let's say 2 x 4 feet size and secure that with a dozen or more anchor bolts or so. You could have the bolts flush with the surface. The edge of the plate could be beveled to help eliminate tripping. The reason I suggest the stronger way with steel plate and many, many anchor bolts, because I'm sure the last thing that you want to see is one of those anchor bolts getting ripped out and ripping along a small hole in your concrete. Sure, 4 might be enough, but who knows. The steel plate version would be sure stronger. What if you solidly inbed the 2" hitch receiver tube flush into the floor. Put a cap on it when not in need. Just putting this other idea accross, my neibour moves his fishing boat with an old snow blower which he removed the impeller and put a trailer ball on it. Found some information. It looks like a single 1/2 inch diameter bolt 3.25 inches deep will support 2500lbs, a single 3/4 inch diameter bolt 3/25 inches deep will support 5000lbs. So, I should be good with 4 anchors with 3/4 inch diameter bolts. This should support 20,000lbs, which is way, way more than I ever expect to need to pull. The link I'm pulling my info from is below, which covers base swivels. So far I've been using my no deck having, open differential lawn tractor to pull trucks around, but even with my portly posterior gracing the seat there's not enough weight on the tractor to move the trucks. Unfortunately, the shed opens onto dirt. I lean left, the right wheel spins. I lean right, the left wheel spins. The trucks only move when I back up and lunge away. I appreciate the ideas here. A 2ft by 4ft steel plate is going to be overkill after what I found above, and the receiver that the winch bolts to is straightline, not bent. I've got two of the receivers, and will be bolting one to the trailer. It looks like I'm just going to have to find the right kind of anchors now. Next time I go to the big city I'll check with the hardware guys. In regard to the lawn tractor, you can add wheel weights to the tractor to help with this issue. There is tractor forum where the guys show how to do this and it is necessary because they use their lawn tractors to move snow and such. Easy on and off mounting so it's only there when you need it. A lot of the guys make their own so don't have to go this route. Yeah man, 1/2" x 3 1/2 to 4" hilti expansion bolts should be just fine! If you wanted a little assurance, use some epoxy with them too. Also, I confirmed with my concrete foreman who's constructing a 3 level podium deck for an apartment complex I'm a PM on in Dallas that this would work. He said it'd be overkill, which to me means it'd be perfect.